This bronze sculpture is rather heavy. There she stands on her tiny feet. Gravity works fine. And yet… there is movement! She is bracing herself against the strong wind that catches her dress from behind. Apart from an accidental tip of her dress she barely touches the ground. She defies gravity, is being carried by the wind. The sculpture is all about implicit movement. Chadwick empowered it with a dynamic force. The result is a sculpture that combines elegance with a certain tension. 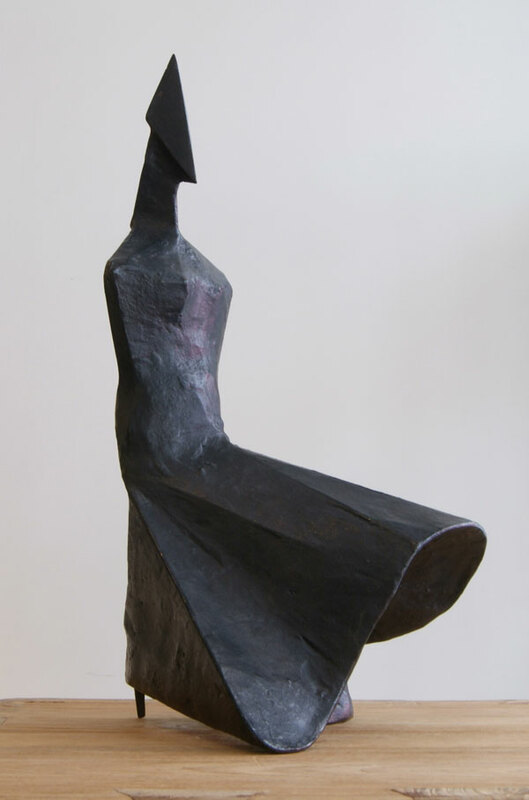 Lynn Chadwick, one of the giants of 20th century sculpture, was trained as an architectural draughtsman. His eye would rather see structure and connecting lines, than the volumes that Henry Moore would have seen. His sculptures literary were constructions, created out of welded rods of iron, that would form a sort of skeleton or armature. As a result Chadwick´s sculptures are almost sketchy, with rough surfaces. This method of construction would evolve into his very personal style. 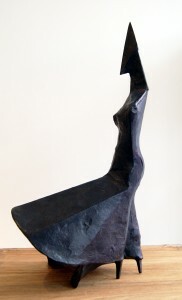 At first, in the 1960’s, Chadwick became interested in the basic principles of the abstract form of the human figure. Later on he focused on how a figure moves and the stances it might take. During the 1970’s and 1980’s he arrived at his visual code of the human form as can be seen in our sculpture, with characteristic abstracted head. Always pointed, triangular heads for the females and rectangular heads for the males. Despite this rigid abstraction they convey a lot of expression and give direction to the figure’s gaze. And they interact with the viewer! Chadwick once commented: “The important thing in my figures is always the attitude – what the figures are expressing through their actual stance. They talk, as it were, and this is something a lot of people don’t understand”.